[Jesus said] “Listen to another parable: There was a landowner who planted a vineyard. 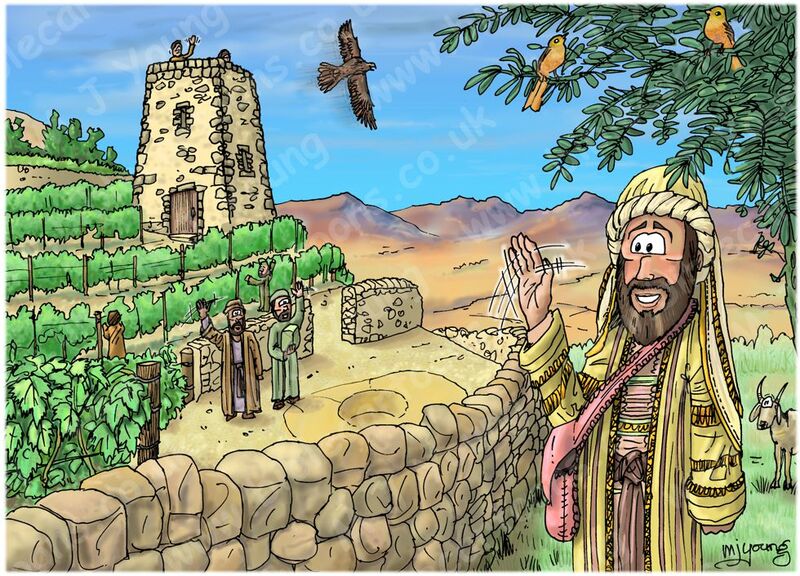 He put a wall around it, dug a winepress in it and built a watchtower. Then he rented the vineyard to some farmers and went away on a journey. The sun rising on the left (east) of this scene provides natural light, and casts shadows to the right of people and objects. The wealthy landowner is in the right foreground, waving goodbye to the tenant farmers, some of whom are waving back, or else working in the vineyard. Jesus’ teaching was wise and powerful, he performed miracles, signs and wonders, he had followers and disciples. I think the chief priests were jealous and envious of Jesus and so they sought to damage or destroy his ministry, if possible. Clearly they opposed Jesus, but the crowds loved him and saw clarity, honesty, integrity and power in Jesus’ words. Unlike the religious leaders, Jesus was genuinely interested in helping ordinary people who he encountered. Jesus made time for such people and his teaching was all about including everyone in the Kingdom of God, provided they repented of evil and accepted the love of God. Jesus deliberately associated with “sinners” (tax collectors, fishermen, common people, prostitutes, etc) the sort of people who the chief priests and religious leaders would have nothing to do with. That alone clearly shows that Jesus had far more genuine compassion than they did. The priests and religious leaders only seemed interested in being the elite, and associating themselves with the rich and powerful. They seemed to have been jealous of Jesus’ popularity with the people and may even have felt threatened by that popularity. They seemed to deliberately oppose Jesus, hence the questions about by whose authority Jesus did the things he was doing. I was keen to make the landowner’s clothing look rich and ornate, representing his wealth and power. All that gold braid and finery takes quite a bit of time to colour up though! 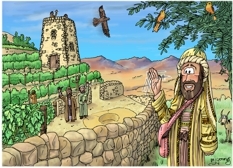 The landowner provided everything that his estate would need to become fruitful: he planted a vineyard (Vitis vinifera (aka the common grape vine)), put a wall around it, dug a winepress in it and built a watchtower. Notice that the farmers were tenants on the land owned by the wealthy landowner; they did not own the land themselves which is important when it comes to their actions and the landowners reaction! In my scene, notice a pair of Emberiza hortulana (aka Ortolan Bunting) sitting in the Olea europaea (aka Olive tree) above the landowner’s head. There is a Falco cherrug (aka Saker Falcon) circling in the sky.